Doesn’t even sound real, does it? We’re all used to tuning our guitars every couple of songs we play. Or constantly checking the tune to make sure that one sharp string doesn’t ruin our performance in the middle of a solo. The only reason I didn’t publish this post earlier was that I didn’t want it to be misunderstood for an April Fools’ Day joke. You really can make your guitar to never go out of tune. Of course, it will require some modifications to be made, and some new equipment to be bought, but apart from that, almost any guitar can sound great … forever (you still have to change strings every once in a while, though). The thing that can make this happen is the EverTune guitar bridge. This thing is just magnificent. It can be installed on any type of guitar (even 7 string ones), and after the guitar gets tuned for the first time it remains in tune until you decide to change the strings to a new set. It doesn’t matter how much you play, for how long, how aggressively, how many bends you make, and so on. EverTune bridge can cope with every style of playing. EverTune bridge is an all mechanical system based on trigonometry and physics. It uses a number of springs to keep the strings in tune. These springs adapt to the situation and change their tension depending on the tension of the strings. As you can see, the bridge doesn’t look very different from a standard bridge (image above). 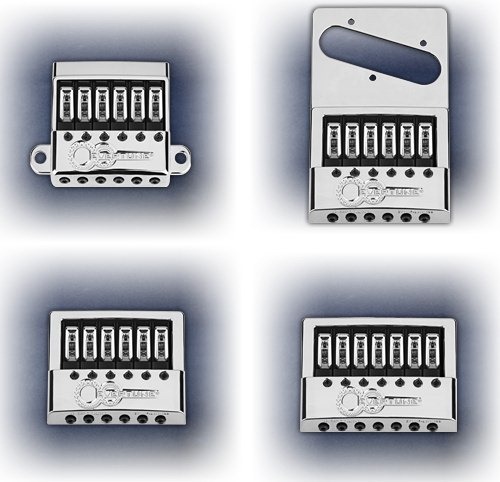 It also comes in different types, suitable for all types of guitars (image below). Just because the bridge doesn’t use any fancy technology (just springs mounted in a very clever way) it’s very reliable as there’s actually nothing that could break down. The product is very different from many servo-based tuners that tune guitar automatically. EverTune bridge doesn’t tune anything. It’s you who tunes the guitar. 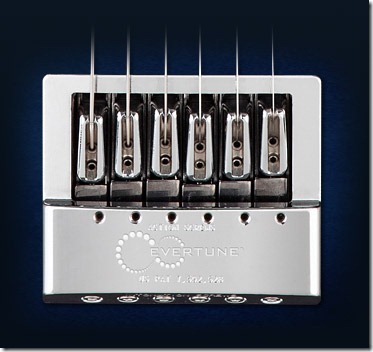 EverTune bridge only makes sure that the strings keep the exact tune you’ve set. You can get an EverTune bridge for $333 from their official online store. It’s not the cheapest product out there, but if you have a nice guitar (preferably your favorite guitar) then treating it with such a bridge is a good idea. It’s always good to have a guitar that’s always ready to play, that’s always in tune. Personally, when I found out about this product I couldn’t believe that such a thing is even possible, but various demonstrations and reviews online have assured me that it’s no joke indeed. What are your thoughts? Did you have the chance to test EverTune bridge by yourself? Great stuff. There’s nothing worse for a beginner then playing a guitar that’s out of tune and not knowing why it sounds so bad! I think if more beginners had one of these less people would have given up without realizing it was just because the strings kept going out of tune. Definitely worth considering if you currently have a guitar that doesn’t hold it’s tune too well. 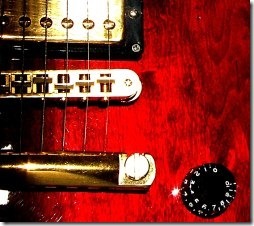 An expensive bridge that is constructed to not go out of tune isn’t always necessary. Just the guitar setup can change a lot. I’m not a huge player, but I only tune my guitar when I change strings. I’m using a ‘baritone-conversion’ neck (28″ scale that fits on a standard strat-body), and a Schaller Floyde Rose floating bridge and a locking nut. I’ll keep the same strings for 4-6 months, playing probably 6-8 hours a week, and never need to re-tune everything.